Browser Notice: Your browser may be out of date. Click here for more information. Your Browser is more than likely in compatibility mode. Generally you can disable Compatibility View by clicking the icon in the address bar. If this doesn't solve your problem or the icon is unavailable, please click here for more information from Microsoft about Compatibility View. Our team is working on a more robust solution and should have an update soon! How do I establish a Handicap Index? Join your fellow club members! Step 2: Post five 18-hole rounds or ten 9-hole rounds. Step 3: On the 1st and 15th of the month, you receive your updated Handicap Index by email (calculated from your posted scores). I’m not receiving my updated Index. HELP! Post quickly and easily at scga.org/handicap. 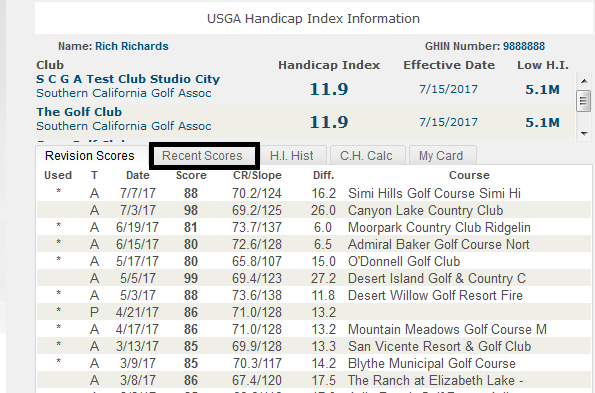 Score posting is also available on the scga.org homepage. The GHIN app is a fast, easy and effective way to post your ESC scores. What’s ESC? Nearly all SoCal courses have a computer that SCGA members can use to post scores after your round. Use the touch screen monitor and follow the prompts to post your ESC score.